getcalc.com's 3 Variables K-map solver, table & work with steps to find the Sum of Products (SOP) or to minimize the given logical (Boolean) expressions formed by A, B & C based on the laws & theorems of AND, OR & NOT gates in digital electronics. This web based Karnaugh's map calculator tool is featured to generate the complete work with steps for any corresponding input values of variables A, B & C. This detailed workout may help users to learn how to solve KMAP for 3 variables. What is 3 Variables Karnaugh's Map? 3 Variables Karnaugh's Map often known as 3 variables K-Map is a special method used in the context of digital electronics to minimize the AND, OR & NOT gates logical expressions. 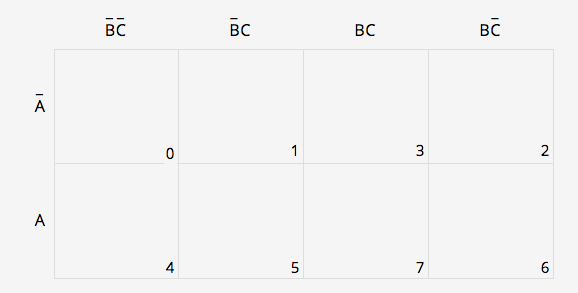 The variables A, B & C are used to address the cells of KMAP table to place the 1s based on the Boolean expression. A is the most significant bit (MSB) and B is the least significant bit (LSB) in the logical expressions used in the KMAP solver. Each variable A, B & C equals to value 1. Similarly, each inverted variable A, B & C equals to 0. Any combinations of A, B & C such as A, B & C represents the place values from 0 to 7 in the K-Map solver. For example, the combinations ABC, ABC, ABC, ABC, ABC, ABC, ABC, & ABC represents the binary numbers 000, 001, 010, 100, 101, 110 & 111 respectively to locate the cells of KMAP table. The numeric or decimal equivalent for the combinations A, B & Crepresents the place values of 0 to 7 in the K-Map solver. For example, the combinations ABA, ABC, ABC, ABC, ABC, ABC, ABC, & ABC represents 0, 1, 2, 3, 4, 5, 6 & 7 respectively. Users can use this 3 variables Karnaugh's Map or K-Map solver to find the SOP for or minimize any Boolean expressions formed by using these three variables A, B & C.
How to Solve 3 Variables K-Map? Users may refer the below rules & step by step procedure to learn how to find the minimum sum of products for the Boolean expression using 3 variables A, B & C. Users can use this KMap/Karnaugh's map calculator for 3 variables to verify the results of K-map or to generate the work for any corresponding input values to learn how to solve Karnaugh's map manually. step 2 Write the Boolean expression in the SOP form. Place 1 for those positions and 0s for everything else. step 3 Group the 1s. The counting of 1s in the group should be in the form of 23, 22 and 21. Therefore you can't group single 1s, three 1s or five 1s or six 1s or seven 1s. The possible combinations of grouping are eight 1s, four 1s and two 1s together. step 4 Check for eight 1s group and encircle the combination, if any. step 5 Check for four 1s and encircle the combination of four 1s, if any. When combining 4 1s the last column and first column considered adjacent to each other. Similarly, the last row and first row considered adjacent to each other. The four corner cells of the KMAP table also considered as adjacent to each other. step 6 Check for two 1s and encircle the combination, if any. step 7 Find the appropriate product term for each combinations.